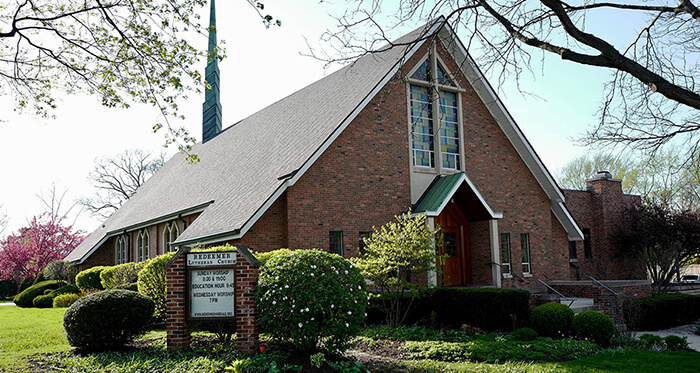 Six families in 1922 established Redeemer Evangelical Lutheran Church in Hinsdale, under the motto “Our Fathers’ Faith in our Children’s Language.” Soon they were joined by 6 young women and three other families. Even before their first worship service, the small group held Sunday School in the place they had rented, the second-floor of a Hinsdale building on First Ave. near Washington St. Ministers from the Missouri Synod’s English District at first led Redeemer’s services, but within months the small congregation’s first full-time minister arrived from Michigan, Rev. Dankworth. At about the same time, the congregation purchased property near the intersection of First Ave. and Blaine St. for $4500. In 1925, Redeemer’s first worship facility arose on that property, a sturdy, well-built brick chapel seating 150 persons. 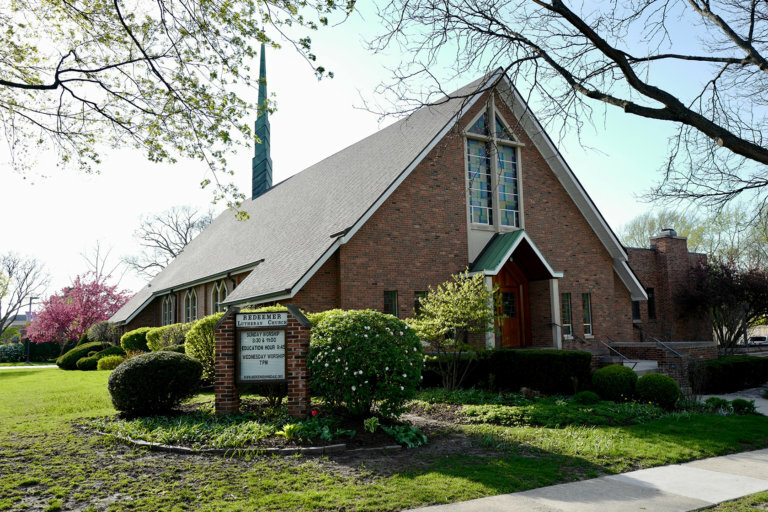 By 1932, Redeemer Lutheran Church was financially independent, and in 1937 the congregation included 230 baptized members and 144 communicants. During WW II, the congregation mailed announcements and religious materials to 21 men and 2 women in the Armed Forces, and a large women’s “Red Cross Sewing Unit” met weekly at the church. During the mid-1950s, the congregation purchased property at the corner of First St. and Park Ave. and the voters authorized the construction of a new worship facility there, Redeemer’s present home. In 1988, the congregation authorized a modern addition to that facility costing $1,300,000. and containing classrooms, meeting places, offices and an elevator. By 1995, the congregation was debt-free. Full-time pastors and associate pastors, two deaconesses, 14 vicars (ministerial candidates in training), musicians and staff members, and many part-time persons have contributed to worship at Redeemer and helped its members learn, study and carry out a wide range of programs and activities. In 1954, the congregation hired an organist-choir director, beginning an emphasis on the music of worship that continues to this day. Over the years, 10 Redeemer members have become pastors or religious workers, almost all of whom have received financial support from the congregation. In 1969, the women of Redeemer Lutheran received the right to vote in the congregation’s meetings. During the mid-1970s, Redeemer’s members voted to dissolve its relationship with the Missouri Synod. The congregation now is “…an interdependent part of the Evangelical Lutheran Church in America” (Constitution, 2008). In the 1980s Redeemer purchased a new Burghaus Organ, which was renovated and restored in 2013. In the 90’s Redeemer began introducing Praise Music to some services, reaching new generations. In the new millennium Redeemer became a primary summer site for PADS – Du Page Country’s homeless shelter, a ministry that shelters 50 men, women, and children weekly, and engages 30 volunteers a week from over a dozen churches and other groups. In 2011 Redeemer called it’s first female pastor, Rev. Katie Hines-Shah, who is still our pastor today. And in 2015 Redeemer voted to allow same gender marriages at our church. Today Redeemer is a vibrant congregation with over 500 members and an average weekly worship attendance of 180. We offer worship at 8:30 and 11am on Sundays and 7:00pm on Wednesday nights during the school year. From Memorial Day through Labor Day we offer services at 10am on Sundays and 7pm on Wednesdays. Nursery care is provided for children 0-6 years at the late service on Sundays. Music is a cornerstone of the Lutheran Tradition of Redeemer’s ministries. Dr. Heike Burghart Rice leads our Festival Choir, Praise Band, and Alleluia Handbell Ringers. She also leads children’s music opportunities and arranges special concerts throughout the year featuring guest musicians and our own musical groups. Redeemer offers educational opportunities for preschoolers through adults under the leadership of Tyler Parks. Sunday School for children takes place Sundays at 9:45am during the school year. Adults take part in an Adult forum at the same time which often features local seminary professors and leaders in social service. Vacation Bible School, Confirmation, Communion Milestone, Small Groups, and other education programs are offered through the year. Service is central at Redeemer. We are well-known in the community for hosting the county’s homeless shelter (PADS) Saturdays May-September. We also support both ELCA ministries and local services. ELCA World Hunger, Lutheran World Relief, and Lutheran Social Services of Illinois are all our ministry partners. We also work with HCS Family Services, Love Christian Clearinghouse, Holy Family School, and Bishop Anderson House. Our active Mission Team plans hands on projects as well. We sponsor annual trips to Feed My Staving Children, gather holiday gifts for needy children and seniors, collect paper goods for HCS Family Services, and rake leaves for local seniors, among other projects. Redeemer also likes a good party! While picnics and dinners have long been a part of our life together, of late we have enjoyed reaching out to other local churches to celebrate together. For the 500th Anniversary of the Reformation (2017) we joined with Zion Lutheran (LC-MS) for an Oktoberfest and Grace Episcopal for a Reformation worship service and concert. We give thanks for all that have gone before and look with hope to a bright future!